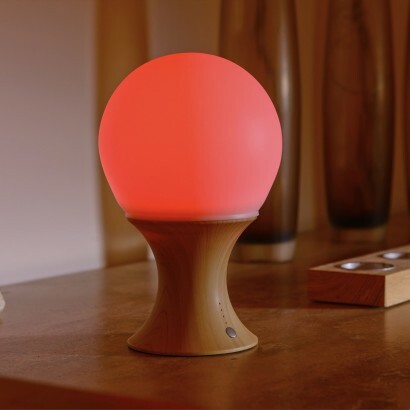 Whether it's presented as a globe or as a mushroom, this tactile mood lamp glows with gentle colour change light in a mesmerising light show. 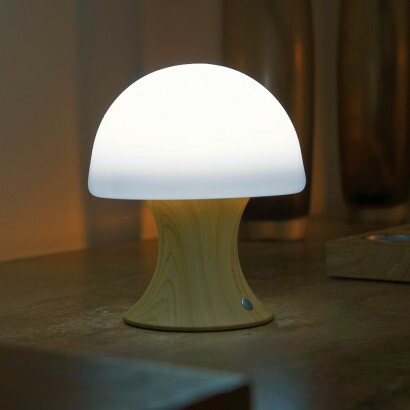 The silicone globe that forms the lamp is squidgy and tactile falling back into place when squeezed and can be pushed down evenly on top of the lamp base to form a mushroom shape. 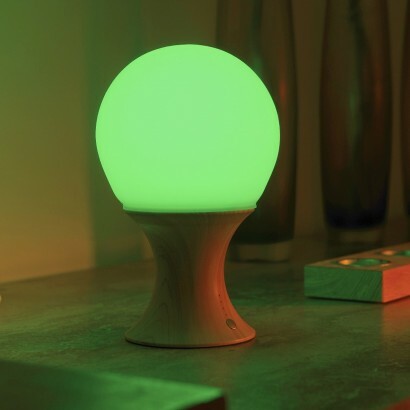 Lit by colour change LEDs, press the button on the base to switch between modes, from colour change to static colour and even set a timer to turn off after 10 minutes, 30 minutes, or 60 minutes. Absolutely love this lamp. Not too big and a nice wooden stand with a charging port. Easy to understand instructions. 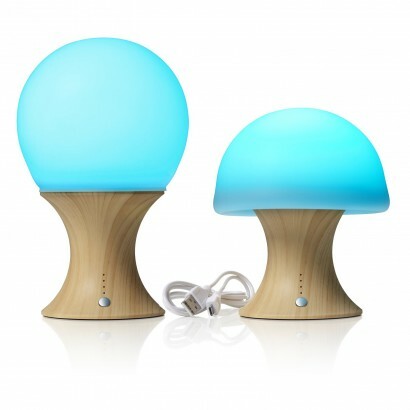 Love the colour changing facility and you can leave as an orb shape or gently push down to make a mushroom shape. My son who has learning difficulties and loves any sort of sensory colour changing light will love this from Father Christmas this year. Highly recommend. 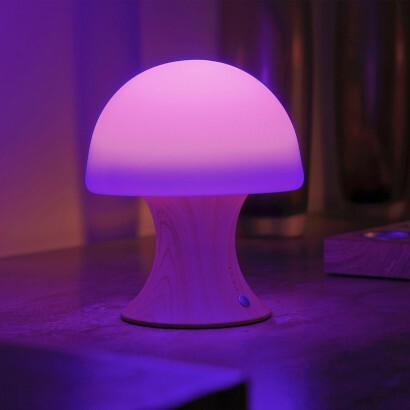 These are absolutely stunning pieces of design, both practical and pretty, good mood lighting as well as just a nice table lamp, tactile as well as being easily cleaned and safe for kids to play with. There is an art to changing the shape, and it is not just a gimmick, it changes the light it casts, think of it as a physical dimmer switch. The globe is removeable and washable. They look great on a dinner table or on a bar with glasses around, as well as by the bedside, the light cast is extremely flattering, too. 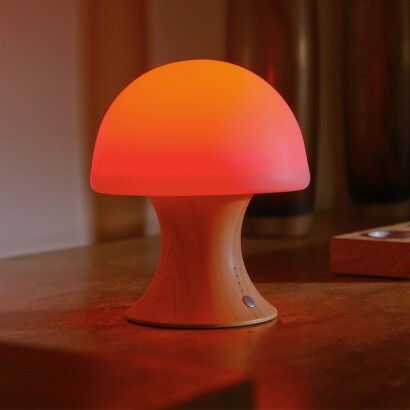 The timer function is useful for many things, not just as a night light, it's very accurate, so you can use it to time things that you do, anything at all. To time something longer than the maximum hour, just change the shape or colour to remind you that one hour has gone by, and set it again for the remaining time required. The battery lasts a very long time, especially on a still colour, and it's possible to use it AND charge it at the same time. They're beautiful, practical, fun, useful, safe for everyone to play with, and very intuitive. One slight con: the light bleeds into the base a teeny bit, but honestly, it's not really a problem. A great gift, and well worth the asking price! Looks great and the lights show is lovely, works brilliantly in our daughter's bedroom as a night light and for sensory play.